The craziest, most imaginative, unique, over-the-top & totally whacked-out stuff to ever hit a crust. 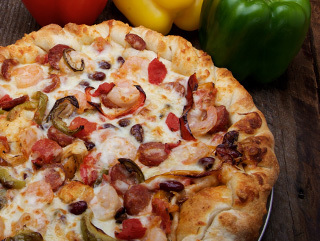 The Dawson-family favorites; many of the original imaginative recipes that birthed the Coburg Pizza Company. Our creative imagination never tasted so good. 100-years after its debut as a sandwich at Reuben's NYC Delicatessen, the Reuben has finally arrived the way it was always meant to be — as pizza! Our best corned beef, Swiss Cheese & sauerkraut combined with the tangy taste of our Sriracha-1,000 Island sauce, topped with pickles. 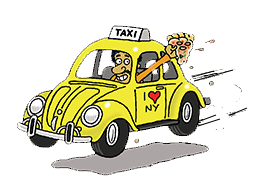 You'll be hailing a taxi, dancing the can-can & singing on Broadway for more. One of Laura Ingalls Wilder’s famous Little House books was Farmer Boy. Mrs. Wilder’s hearty-culinary imagination was brought to the table page after page. 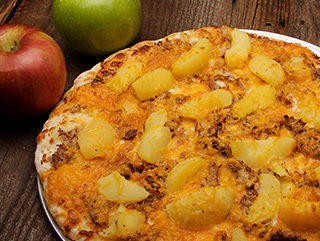 If she’d been making pizza, The Big Apple would have been Almanzo’s favorite: smoked-pulled pork with our special dry rub, fuji apples & cheddar cheese would make one incredible farm-family-friendly-meal. Dozens of pilgrimages to Israel have brought together this amazing staple of the Mediterranean world, the Jerusalem Shawarma… as a pizza. Roasted Lamb and beef, together with our special Shawarma spice blend, Oil pressed from the fruit of the olive tree, Za'atar (a beautiful Middle Eastern herb blend), Goat Cheese (Chèvre) & Hummus made from chickpeas, flourishing with salads of fresh tomatoes & cucumbers added after baking, with our special lemon-garlic Tahini sauce. Shalom. The pizza is in the building! Memphis is known for Elvis & Graceland, but only slightly lesser known as the pulled-pork capital of the south. 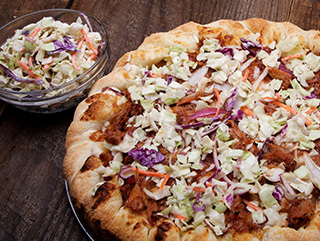 Thick chunks of smoky pulled-pork & piles of onions smothered in Sweet Baby Ray’s traditional BBQ sauce, all atop a mess of jack cheese & crowned with our own special recipe coleslaw... Elvis would love it. 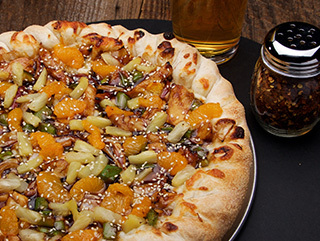 You’ll feel you’ve sailed to a great vacation getaway with our island creation of teriyaki chicken on mozzarella, onions, bell peppers, pineapple & mandarin oranges with an extra splash of sauce & sesame seeds. This pie will make for some enchanted evening! For the little kid in all of us! Nana’s little brother Mario was always the baby of the family, no matter how many years he had lived through. 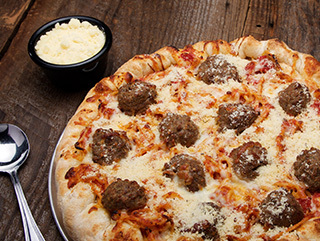 His playfulness helped to inspire this fun food pie with our great saucy spaghetti & meatzaballs, mozzarella & parmesan cheeses & a bit of frolic. Fully loaded & very NW! 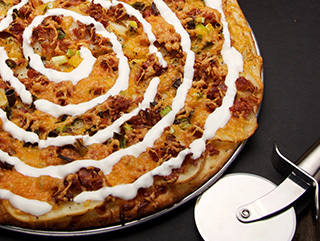 Thinly sliced russets, a touch of butter, country bacon, cheddar, sour cream & green onions — you won’t believe we can do this with pizza! 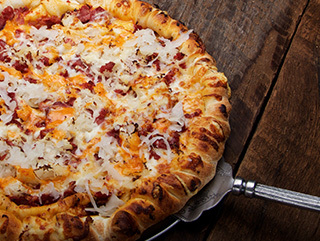 Classy pizza isn’t just for dinner anymore. We were asked how creative we could be with breakfast & we started thinking about those inspired (& filling) farmer’s omelets. Country sausage gravy, potatoes, eggs, cheddar & bacon. 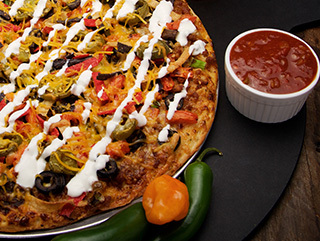 Everything is wild in Alaska… The Klondike, gold rush history, glaciers & the salmon… You’ll just have to taste this pie to put it all in perspective. 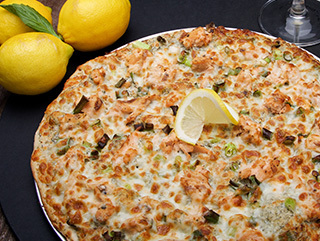 Grilled salmon on our own sour cream-cream cheese-dill sauce, green onions, mozzarella & a touch of lemon. Wild thing, you make my heart sing. 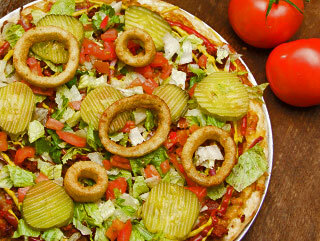 The old west version of our incredible burger pizza. We’ve removed the cold stuff & added campfire inspired Sweet Baby Ray’s BBQ sauce. The old Coburg Café created a classic & our take on the original will bring back that old time burger love…Double beef, bacon & cheese on this nostalgic hit, with onions, pickles, lettuce, tomatoes, mustard & ketchup, & garnished with onion rings. 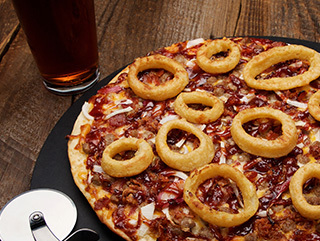 It’s the way burgers were meant to be...as a pizza. 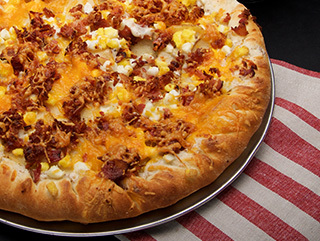 Simple comfort food, with nearly a pound of each ingredient on a grande pie. 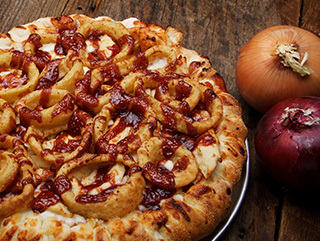 You won’t believe how these tastes meld together: Sweet Baby Ray’s amazing BBQ sauce, smoky chicken breast, mozzarella & provolone, loaded with crunchy onion rings. Twas an incredible journey between the two coasts & that route was the inspiration for this taste sensation. 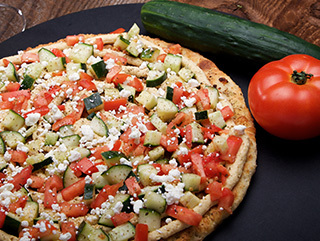 These 12 ingredients (6+6) were meant to live together (just like Mike & Elda). 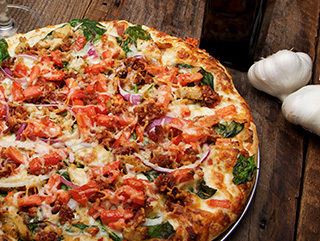 Cream cheese, fresh spinach, herbed chicken, bacon, onion, garlic, tomatoes, provolone, romano, asiago, parmesan & a splash of balsamic vinegar.